Presentation for Debates on Europe. Kharkiv, December 11, 2015. Which objects are being destroyed first during the war? Roads and bridges. Communication infrastructure is the first thing to be repaired to build peace. Ukrainian Peacebuilding School focuses on building the roads between the people and repairing the bridges between the communities. Steven Spielberg, when presenting his new movie “Bridge of Spies”, said that for him not much has changed since the Cold War epoch. For Ukraine, the change is huge. The Wall between the two worlds moved 2000+ kilometres eastwards and now it is our turn to guard this Wall and Bridges between the two worlds. The Wall now looks differently too. Compare Berlin and Mariupol. Since September 2014, the Ukrainian Peacebuilding School works in the most difficult regions of Ukraine, bordering occupied territories, frozen conflicts and past bloody conflicts. For a year, I have been a coordinator of this project in Donetsk oblast and spent much of my time travelling the roads and bridges there. I spent less time at home in Kharkiv than in towns and villages adjacent to occupied territories, speaking to thousands of people. I will tell you my opinion of what is happening in the Eastern part of Ukraine and our future based on my field experience and experience of dozens of my colleagues – our project managers. What I do not know is how much more Ukrainian blood will have to be sacrificed until that day. This photo of my colleague who is responsible for Donetsk oblast in our project now shows the symbolism of Ukrainian red and black flag – national blue and yellow flag covered by blood, the flag of warriors. The flag is centuries old. Was the Russian occupation inevitable? That is a most frequently asked question during our trainings. Yes, it was inevitable and our research explains why. We identified four major conflicts in Ukrainian society, which are relevant to the explanation. Identity conflicts. Ukrainian society in the east identifies itself as Soviets, Ukrainians or Europeans. Soviet and European identities are diametrically opposed. Most Ukrainians remember their history and the destructive role in it of a Russian state. However, most of the population of eastern Ukraine remember a different version of the history. Most old cemeteries in Donetsk oblast demonstrate the conflict of historical narratives in the heads of the population. See the combination of the communist star and the cross, symbol of religion persecuted by the communist. It is rusty, has no name and abandoned. However, it is still there and influences the opinions. Most important conflict we address in our work is the conflict of the visions of the future. What common vision of the future could have the brothers and sisters of these Protestants savagely killed by the occupants in Slovyansk in 2014 and the people who still support the occupants? The polls conducted within our project and the other polls confirm that Ukrainian citizens living in the Ukrainian controlled territory are not divided really. Their opinions differ no more than in other European countries. Most people just want to live in peace. However, the above mentioned conflicts could lead to a divided society if not addressed timely. We studied the conflicts with some similarities to ours. Like with Israel, Russia does not recognize the Ukrainian nation and the right to a Ukrainian State. Like in Northern Ireland, our conflict with Russia has centuries old history. However, the conflicts inside Ukraine are not that fundamental and have to be transformed into civilized processes. You see the historic photos from Kharkiv of January 12, 2014, where we experienced the model confrontation, which was staged later during the occupation of Donbas. I was present there, these are my photos and I can show you why the attempt failed. On the right – the peaceful assembly of participants of first Euromaidan Forum. On the left – the supporters of president Yanukovych. Two sides were divided by the police. The hooligans were trying to throw stun grenades towards Euromaidan people, the ruling Party of Regions side tried to silence us with high level loudspeakers, the standoff was colourful, noisy and emotional, but peaceful. Notice the both sides were using Ukrainian national flags, both sides were using Ukrainian music. Look at the photos – do the sides look as enemies? Russia tried to ignite the conflict in Kharkiv later during the so called Russian Spring of 2014 and failed. They did not find enough local active people ready to fight for the ideas of Russian World neither in Kharkiv nor anywhere but in Donbas. Russians did not really know Ukrainian society. It turned out that the number of supporters of Russian World in Ukraine is low and is absolutely dependent on regular brainwashing of Russian TV. Identity conflicts in Ukraine exist but they are purely virtual. Perception of Russian World is based on TV image made in Moscow and not real life experience. Life in Russia does not resemble this glamorous picture. Opinion polls confirm the amount of Russian World fans is very low in Ukraine. The Soviet Union does not exist any more and will never return. The Soviet identity is strong in eastern Ukraine, however Russia failed to monopolize it and this identity is predominantly Ukrainian. Kharkiv was the first capital of Soviet Ukraine. It is impossible to remove “Ukraine” from this history. The perception of Europe is virtual for majority of eastern Ukrainians because majority had never been there and had no contacts with Europeans at all. Only 17% of young Ukrainians visited Europe. It is easy to manipulate virtual identities and Russian propaganda machinery does it. When the propaganda channels influence is restricted and people return to real life the identity conflict becomes marginalized. However, the threat of escalation of identity conflicts still exists. We do not want a divided future of Ukraine. 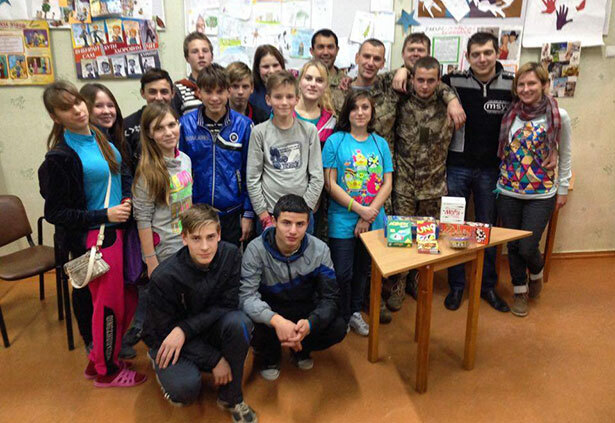 Ukrainian Peacebuilding School develops strategies of transformation and prevention of borderline conflicts. We defined the four major problems of Ukrainian society as bad communications, inability to plan the future proactively, misunderstanding of security, and the absence of common criteria of evaluation of reality. Look at this photo and think about the purpose of this fence? It is a very typical fence inherited from Soviet times. I will elaborate in these four problems. Most define security as the absence of threats. Misunderstanding of security by active Ukrainians is a security threat by itself. The very basic idea that Ukraine is not Russia still requires confirmation and affirmation especially in territories adjacent to occupation. 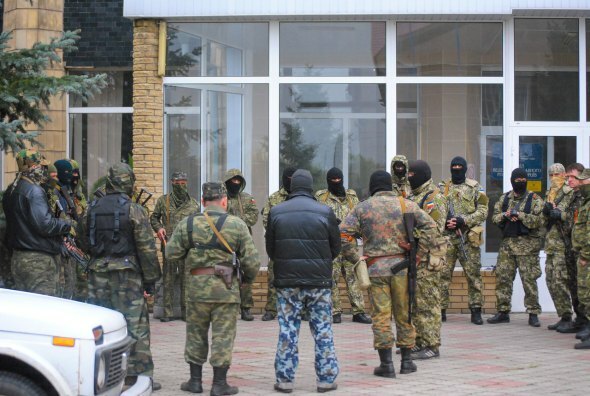 This picture however shows a more fundamental problem with security in Ukraine. What you see is the WWII German fortification on the strategic heights above Kramatorsk renovated in summer 2013 and ready to be used as… real fortification. Local activists classified this event as public money stolen by city government and did not pay attention that it was a military infrastructure object ready to use. Genocidal history of Ukraine explains why people are unable to plan the future proactively. The cult of death enforced by the Soviets seriously damaged the social consciousness. Her whole lecture illustrates that the value of life in the Soviet Union was almost zero. Old Russian saying, “Women will deliver more babies” always reflected the price of life there. Still does. Ukrainians are different. History taught us to count every life – saved and sacrificed. We are chanting, “Heroes do not die”. Now we have to communicate this difference to the world and to all our citizens. We also have to build the bridges allowing people who are willing to live in the Russian World and who share its values to go to Russia, to emigrate in a civilized way. Right now, it is not that easy. Roads to emigration both ways looks like these pavements. Bad communications in Ukraine were inherited from past empires and pertain both to physical roads and to the interpersonal and intergroup communications. Society in eastern Ukraine is atomized; both physical obstacles and Soviet mental traditions determined low mobility. People in Donbas rather used money to buy expensive clothes than travel abroad or even to the neighbouring region. I will show you physical bridges but I ask you to think about the human relations. People living nearby are sure that the Ukrainian government does not repair these bridges because there is danger to waste money and have them destroyed again in the next stage of war. Sure, it undermines their confidence in the possibility of peaceful future. It does not help them to plan for the future, it frames the escape to the land where there will be no war eventually. Ukraine suffers from one of the greatest displacements in history. Broken bridges encourage further displacements. Sometimes temporal structures are built to facilitate passage. Old popular Soviet saying declares, “There is nothing more permanent than a temporary structure”. Temporary solutions do not boost the feeling of security. I will use a success story from Kharkiv to demonstrate what should be done to give people hope and build communities. The old fragile temporary bridge stopped being a transport venue long time ago. It was destroyed and a new solid beautiful bridge was built somewhere close to the old one. Ukrainians have problems agreeing on what is good and what are the indicators of progress. When this bridge was in construction there were many voices questioning the purpose of the bridge and suspecting city government in stealing public funds. Citizens accepted it is a good bridge together with a new adjacent park and renovated riverbank when it became a most popular wedding site and a recreation place. It happened quickly, only a year of a new beautiful and friendly public place functioning was enough to establish a new, very European Kharkiv city tradition. People tend to agree on evaluation of broken bridges as visible problems and popular recreation zones as successes; however, the process of building bridges or building peace or reforming society takes time. There are no common criteria of evaluation of transformations. It pays to invest into public spaces. During the Soviet times, we used to say that it takes centuries to trim the lawns to make them suitable for public recreation and safe for kids to play. Well, here it took just a year. Places and technologies connecting people, facilitating and encouraging the communication are the best security strategies and peacebuilding tools. How to build sustainable peace in Ukraine? Establish and foster personal friendly contacts with people across the Ukrainian border with Russia. Foster and promote true multiculturalism and security aware tolerance. Promote open peaceful Islam like we do have and cherish in Ukraine. Educate as many active adults as possible on conflict studies, dialogue practices, social psychology, and behavioural economic, human security. Those people will build the bridges to minds of the others. That is what the Ukrainian Peacebuilding School is doing and that is what gives us hope and confidence that someday we will break that Wall.